What is the purpose of using peat moss in a casing? It says on the bag it's to help loosen soil and hold moisture, but vermiculite does that too, so why the need for peat moss? Also, doesn't peat have a lot of organic material in it? If it does, wouldn't that be an invitation for contams to set in? I'm not doubting its quality as a casing layer, if it sucked and wasn't necessary it wouldn't be used. I just want to understand it better. Thanks for any input on this. Makes sense. Now what about the fact that it's loaded with organic material? Doesn't that mean it's full of nutrients and would be a great place for contamination to set in? Coir also has minimal nutes though, so dont think that will change it. The nutes are really minimal though and dont matter so much as long as you change the pH and sterilize well. The raising of the pH with either peat or coir by use of calcium carbonate and hydrated lime keeps the pH at a neutral 7, making it hard for green to grow (likes a more acidic environment) but easier for mushies to grow. Do either of you guys test the Ph of your casing mixture before applying it to your shrooms or after flushes or anything? I think it would be nice to know what I'm laying on top of my substrate, but if the experts don't bother then I won't either. 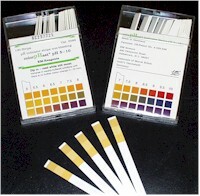 It's quick and easy to test your casing layer with some pH strips. I'd recommend it. Hey Diver, around where should the pH of the casing be (to maximize growth and minimize contamination risk)? Would a pH of ~7.5 be acceptable? Thanks! 7.5 to about 8.0 is a very good start. you want it slightly alkaline to buffer against acid secretion from the mycelium. Contams like acidic environments. I've got some Ph strips, but how do you test soil with them? Don't they have to be immersed in liquid to work properly? Also, the strips I have only measue whole numbers, like 6, 7 and such. How would I measure between those numbers? squeeze out a single excess drop of water, all it takes is one small drop of water for the strips to work. Your strips will give you a close range, but if you want to be exact you'd need strips with a smaller interval. They will get you close enough to where you need to be. Shoot for a color between 7 and 8. 964 topic views. 34 members, 94 guests and 16 web crawlers are browsing this forum.